In Yardmaster, 2-4 players compete to build trains comprised of railcars of different goods and values. However, players are restricted in connecting railcars of only the same value or good type, so if you grab a railcar you can't use, it needs to wait in your sorting yard until it can legitimately hook up to your train. Buy a railcar by discarding 1-4 cargo cards of the same color as the railcar, with the number determined by that railcar's value. Inside Yardmaster’s sturdy little box can be found one-hundred-and twenty-five cards, six tokens, and a twelve-page rulebook. The cards consist of three types: fifty Railcar Cards, seventy Cargo Cards, and five Engine Cards. The Railcar cards and most of the Cargo cards consist of matching types. So there are Automobile (purple), Coal (blue), Livestock (red), Oil (yellow), and Timber (green) Railcars, which need to be loaded with Automobile (purple), Coal (blue), Livestock (red), Oil (yellow), and Timber (green) Cargo cards. The Railcars are numbered from one to four, the number indicating both the number Cargo cards they need to be loaded with and the value that they add to a player’s train. So an Oil Railcar with a value of two needs to be loaded (or purchased) with two Oil Cargo cards before it can be attached to a player’s train. Ten of the Cargo cards are actually Bonus cards which grant a player various extra actions. The Engine cards indicate the start of a player’s train. In addition, the game comes with six card tokens—five Exchange Rate tokens, and one Yardmaster token. There is an Exchange Rate token for each type of Cargo, enabling a player swap two of a particular Cargo card type for one of another. So for example, the Coal Exchange Rate token can be used to swap two Coal cards for a another type of Cargo card, say Livestock or Timber. The Yardmaster token grants the holder an extra action. At game’s start, each player receives an Engine card, a random Exchange token—if there are fewer than five players, the spare ones sit in the middle of the playing area where they can be swapped for during the game, and five Cargo cards. Four Railcar cards are placed face up in the Arrival Yard and one Cargo card is drawn and placed face up as the start of the Discard pile. The player to the starting player’s right receives the Yardmaster token. On his turn a player can conduct two actions out of a choice of three. He can draw a new Cargo card—either from Cargo deck or the Cargo Discard pile; buy a Railcar from the Arrival Yard; or swap his Exchange Rate token with any other. To buy a Railcar, a player must discard a number of Cargo cards equal to the number on the Railcar. If the Railcar matches the type/colour or the number of the last Railcar in his train, a player can immediately add it to his train. For example, the last Railcar in a player’s Train is a Timber Railcar with a value of one. He can add any other Timber Railcar to his Train, no matter what its value, or any other type of Railcar if its value is also one. If a player has purchased any other card , that is, not another Timber Railcar or any Railcar with a value of one, he cannot add it to his train, but instead must store it in his Sorting Yard until he can add it—and that is a free action. Swapping Exchange Rate tokens is simple matter. Once a player has one, he use it on his turn—or a subsequent one—to swap two Cargo cards of one type for one that he wants when making a purchase. This continues until one player manages to build a train of the required length—this varies depending upon the number of players—and wins the game. So far, so simple, and that is Yardmaster at its most basic. It is quick and easy, but Yardmaster has some interesting mechanics that adds a wrinkle or two to the game play. The first of these is the Yardmaster token. This allows a player to take three actions on his turn rather than two, but instead of passing round the players in a clockwise direction, it goes the other way, anticlockwise. This means that only one person can benefit from the extra action per round. 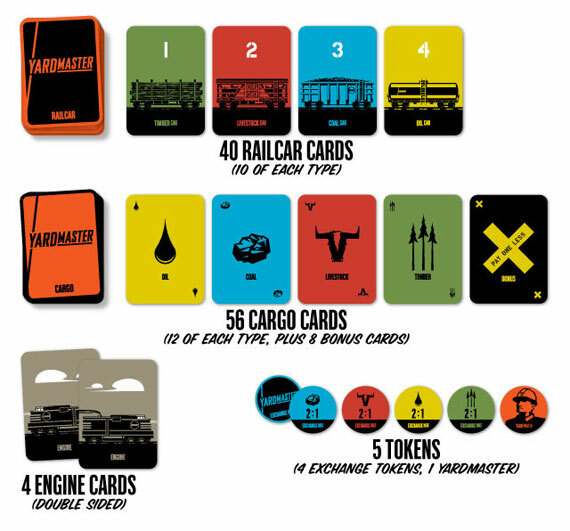 The second is the bonus cards, which grant bonus actions, such as drawing extra Cargo cards, paying less for a Railcar card, gaining an extra action (which can mean a player has four actions if he also has the Yardmaster token! ), and so on. Third, whilst a player can take a Cargo card from the top of the Cargo deck or the Discard pile, the latter can be blocked if a player uses a Bonus card and places it on top of the Discard pile as Bonus cards cannot be drawn from the Discard pile. Fourth, swapping Exchange Rate tokens can be an effective means of acting against another player, though this requires a player to keep a careful eye on what Cargo cards his rivals are drawing. Physically, Yardmaster is very well produced. The box is small, but sturdy and has a nice heft to it. The cards are all good quality, the rulebook is clearly written, and if you have the Kickstarter version, then the tokens are chunky pieces of wood rather than cardboard. If there is a downside, Yardmaster is not quite as good for two players, as this requires the Yardmaster token to be swapped between the players, who only get to use on every other of their turns. This is a bit of a chore. Not too complex, Yardmaster is a nice little game, more than suited to a family audience. It may not quite offer depth that hardened gamers might want, but it is still a solid filler. Add a Review for "Yardmaster"